To paraphrase leading Australian critic, David Stratton, “Not everyone is going to like the idea of spending an evening at the cinema with Ray”. Ray being of course being the protagonist , the hitman, that grinning guy on the posters and basically the fellow we are locked shoulder to shoulder with ‘home video’ style for almost the entire length of The Magician. To count disliking Ray to the point of not being able to enjoy or even watch the film is not wrong, but rather maybe missing out on what an accomplishment this film is for it’s young writer/director/star, Scott Ryan. Fresh out of film school and made with merely three thousand dollars of his own money, Ryan’s Magician is an excellent example of what can be achieved when you have passion and ability. Most of the script appears improvised so it‘s hard to decide whether it‘s a work of great writing or performance, but regardless, what is said in the film is it’s strong point. Ryan’s snappy dialogue and matter-of-fact observations, delivered mostly direct to camera, even rivals much of Tarantino’s glossed pop culture oscar winner, Pulp Fiction. Of course, Ryan clearly retains an influence from the banana chinned boy wonder. Whether it is discussing Clint Eastwood’s appearance (or not) in The Dirty Dozen, sleeping next to another bloke with no pants on or the moral dilemma of Wayne Carey banging his best mate’s missus, Ray is philosophical, funny as hell and never short for words. It took me a while to get into the flow, but once I did, I was hooked and the curiosity of what was to become of Ray’s in-toe victim, Ben became overwhelming. With well over eighty minutes shot, the editing (done by three separate contributors all up) deserves a lot of credit especially for making the last half of the film so interesting. As we’re looking through nom de plume Max’s (our narrative device of a man so intrigued by Ray, he wants to follow him through his day to day) camera the whole time, I do have my reservations in saying this was well directed. Completely handheld, the film comes off as very loosely structured. At the same time however, it is hard to deny the film is all the more convincing because of it. Perhaps this was a deliberate approach to make it seem shot by an amateur more than it actually is. This is a character driven piece, and drawing us into Ray’s world via this style is possibly a stroke of genius in hindsight. 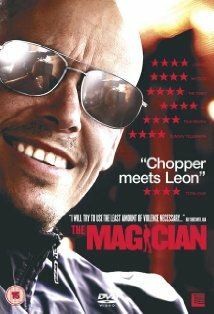 Overall, it’s not just the entertainment value that makes The Magician a winner, because like him or not, Ryan’s performance as Ray is excellent, but it proves what can be achieved without major funding in this country. Certainly it took a few decent producers who got their hands on it and do an ace job of getting it on our cinema screens, but considering how often people complain about the ‘type’ of films Australia comes out with, a lot of them must be missing the talent that is right under their noses.